You might’ve heard about California’s drought. While the rest of the state is figuring out how to use less water, the challenge I’ve had on Serenity Valley this year is the opposite: how to use all the water I have. 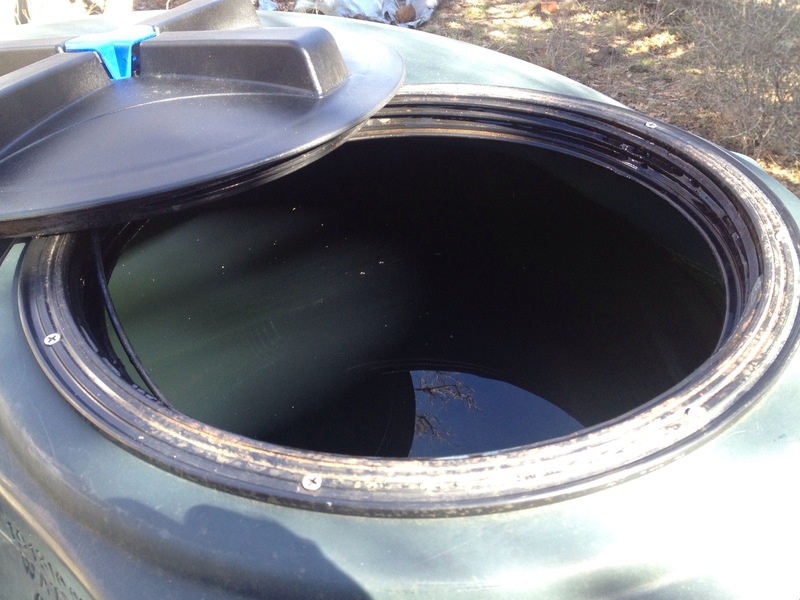 The 1000 gallon rain barrel I set up last year was full by early February, and was then topped off again in early July thanks to some unseasonable summer showers. Add the 300 gallons in my other tank, and I’ve got 1300 gallons to play with this year. Granted, it isn’t much water at all, but using it up has turned out to be a greater challenge than I expected. I’m not there much so most of the water is intended to be used to irrigate my garden, which has turned out to be less than trivial. I initially thought I could hook up my drip irrigation lines to the 1000 gallon tank via a timer, but it turns out the timer all but kills the pressure, so the drip heads don’t work consistently, or at all. 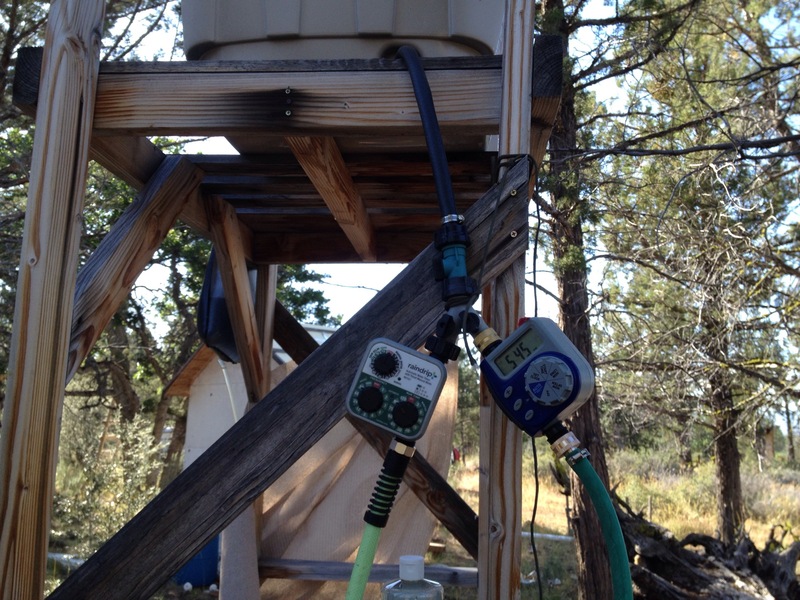 Using the 50 gallon tank on the “water tower” solves this problem because I can set up the irrigation timer several feet off the ground, which generates enough pressure through gravity. However, since I need to transfer water from the bigger tank to the water tower myself (using an electric pump), those 50 gallons need to last while I’m gone — which can be as long as a month. One option was to build an automated system to transfer water from the bigger tanks to the water tower. But, automated things are prone to fail, and if the system failed, the 50 gallon reservoir wouldn’t last very long. 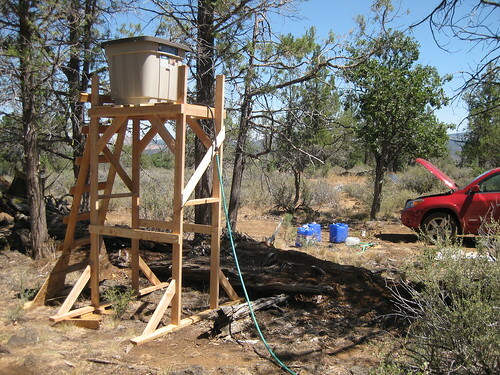 Plus, the “water tower” was starting to show some age, being made of untreated 2x4s and having been exposed to the elements since 2010. My 1000 gallon tank was nearly full by early February. Some off-season summer rain then topped it off again in early July… Need to use more water! Experimenting with 2 irrigation lines set on separate timers. One was set to go every 7 days, the other every 3 days. Also, Water Tower 1.0 still on active duty! Garden ’15. This year I have: 2 grape plants, 2 potato bushes, 3 strawberry clusters, one pepper, one cucumber, 2 mystery squashes, 2 kabocha squashes, 2 melons, and 2 tomatoes. 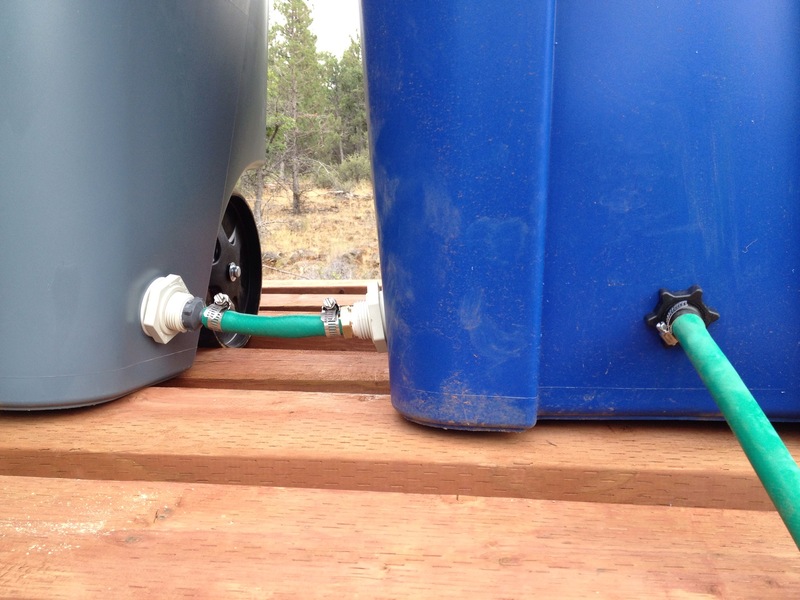 Trash bins make relatively inexpensive exterior-grade water containers. All you need are some bulkhead unions and hose adapters. Trash bins never looked so good! The irrigation timer is a full 8ft off the ground, which drives plenty of pressure to the drip irrigation heads. Some day I might replace the bins and upgrade to a 200 gallon tank, if I have confidence it’ll support 1600lb of weight. I planted a cherry tree! 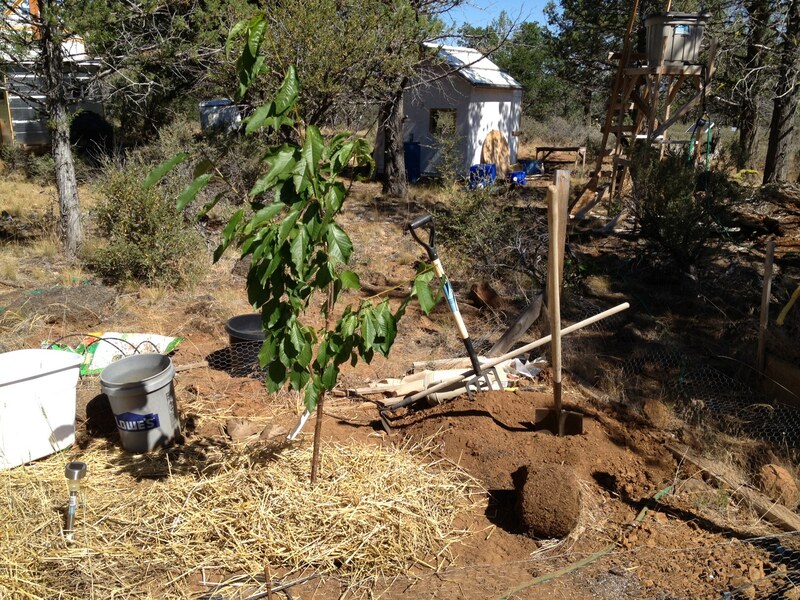 On a recent trip to Serenity Valley, I planted a cherry tree. 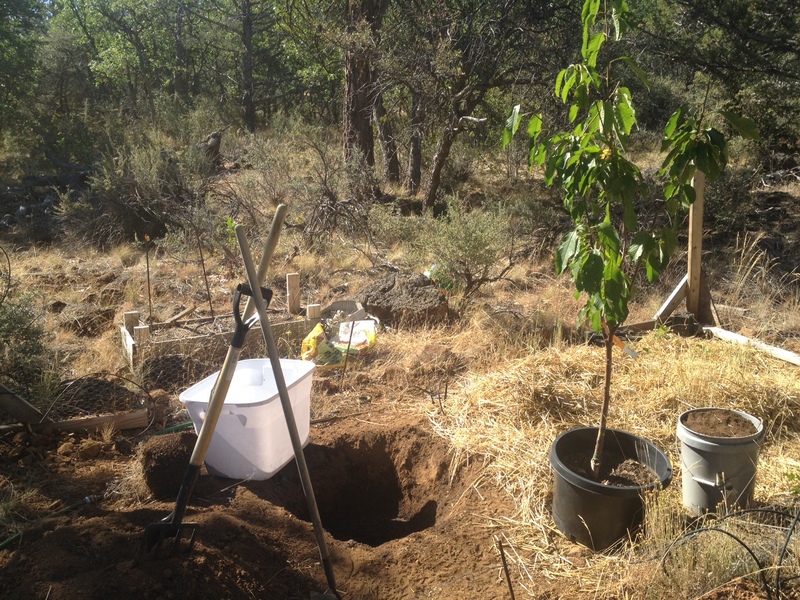 Now, planting a fruit tree in the high desert, where there is no rain nor running water for half the year, may seem foolish. And maybe it is. But I planted it anyway. I think of it as an act of commitment; I’ve planted a tree, now I have to keep it alive. A couple of recent developments make this decision slightly less foolish than it may sound at first. One is that I got a 300 gallon water tank, which I plan on hooking up to my gutters to collect run-off this Winter / Spring. There’s usually 20-30 inches of precipitation in the wet months, and even if I manage to collect 10″ of that, I should be able to harvest around 1000 gallons off my cabin roof alone. (If you want the math, it’s 0.6 gal / 1″ of precipitation / 1 sqft of surface area. 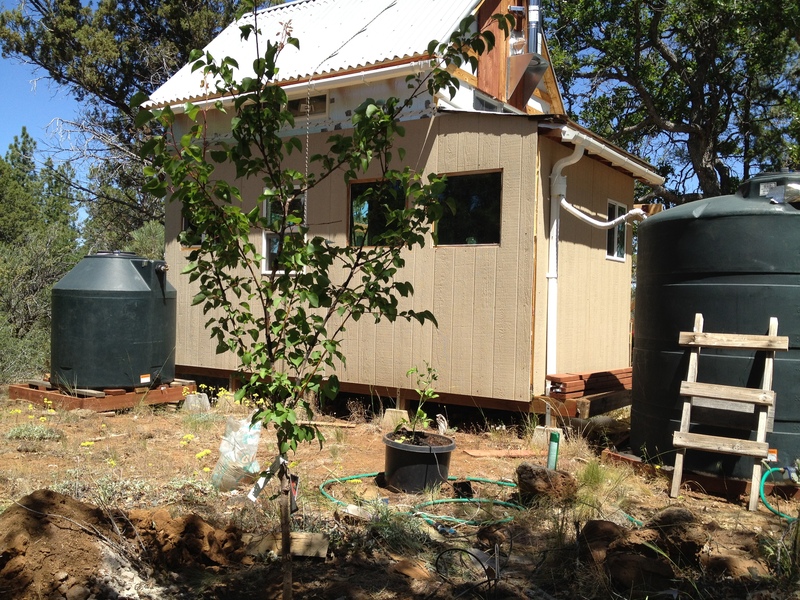 So, 0.6 gal * 10″ of precipitation * 170 sqft roof = ~1020 gallons.) If my math is right, my 300 gallon tank won’t capture all the available water, so I’ll probably add more. The other recent development is that I (or, rather, a neighbor) found a couple of sources of water closer than the gas station in town, some 17 miles away. It turns out there’s a volunteer fire station 3 miles down the road that has its own well, where locals can take as much water as they want for a very small monthly fee. There’s also apparently a local who owns a water tanker, and will deliver water (if he likes you). So, between my rain barrels and an abundant water source just 3 miles away, I’m fairly confident I can keep the cherry tree watered for the foreseeable future. The next step was to choose a variant. They had a few options, including famous sweet variants like the Rainier cherry, but all the sweet variants need pollinators (i.e. another cherry tree). So I ended up picking a Montmorency cherry tree, which is a self-pollinator and semi-dwarf; two characteristics that should work well for me. On the other hand, the sour fruit that the Montmorency bears will only be good for canning or baking. It’s a bummer I won’t get to eat sweet fruit right off the tree, but seeing how cherries have a short shelf-life, having a variant suitable for preservation probably isn’t such a bad idea. Planting a tree isn’t terribly exciting in and of itself. Digging the hole ended up being a lot of work because I encountered a rock-hard layer of clay that I decided to try and bust up — by repeatedly driving a pitch-fork into it with a sledge hammer. A pick-axe probably would’ve made things easier, but I didn’t have one. Once I had the tree planted, though, I decided to try something new. 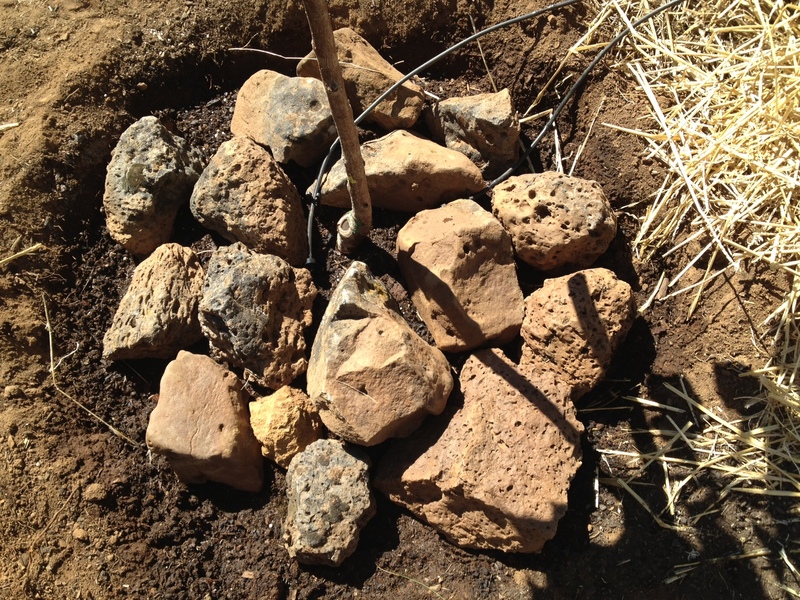 I’d read that Native Americans and others living in arid regions were known to mulch their plants using rocks. The theory is that the rocks would slow moisture evaporation, dampen extreme temperatures by acting as a thermal mass, and possibly also improve the soil by slowly leeching minerals. I know that moisture evaporation and extreme temperatures are a concern where I am, so I decided to give it a shot. 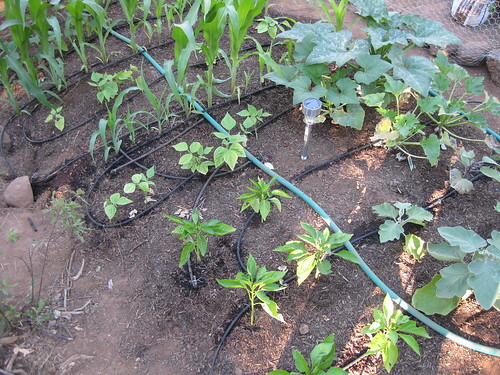 I also placed 3 drip irrigation heads (of which two you can see in the photo) between the rocks. 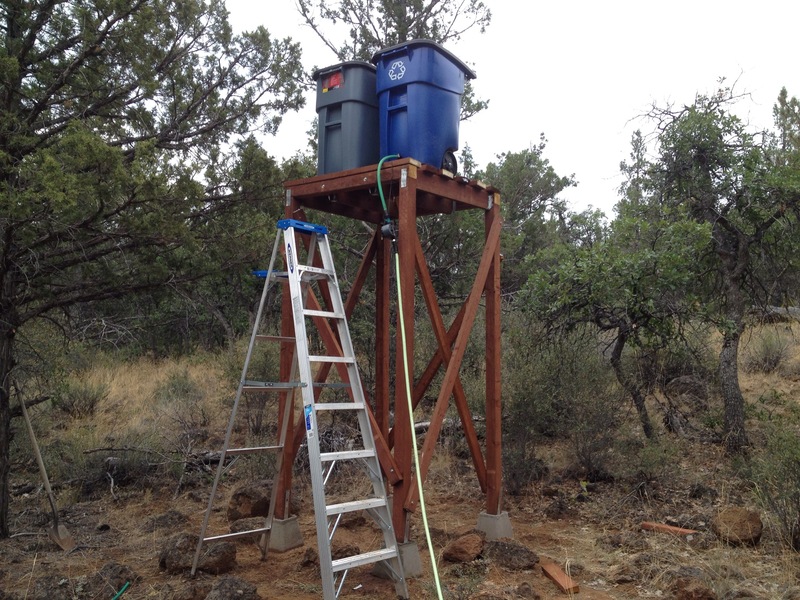 Incidentally, the drip irrigation is the same gravity-fed system hooked up to my water tower that I set up in previous years, which keeps my garden watered while I’m away with the help of a garden timer. Finally, I covered the whole thing with straw to provide further shade from the harsh sumer sun and cold winter frost. This past week since returning from Burning Man hasn’t been too productive. 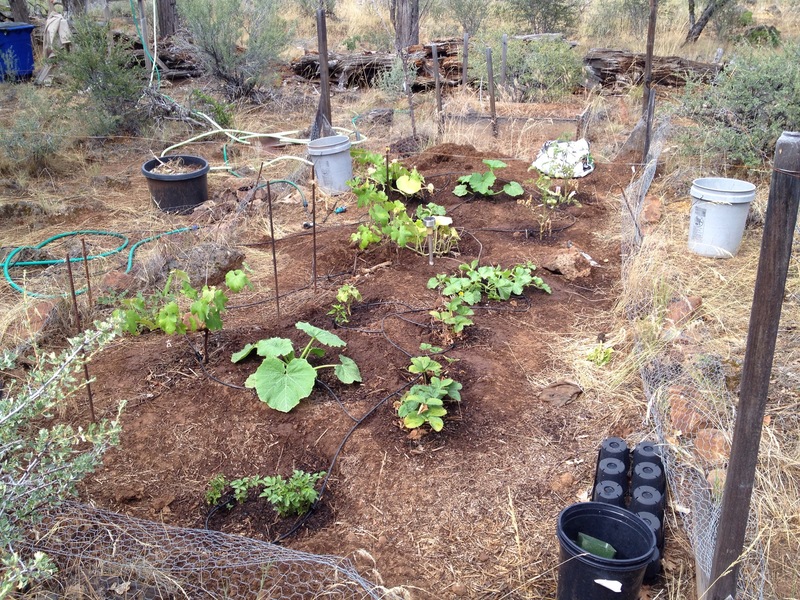 It rained all day Wednesday and well into Thursday morning, which, though highly unusual for this time of year, and did rob me of my ability to heat up my solar shower, did relieve me of any concerns about irrigating my garden for the week. On Thursday, the temperature barely rose above 60F, and dropped to around 36F at night. I was hoping the growing season would last longer, but it seems likely that I’ll see frost in the not too distant future. 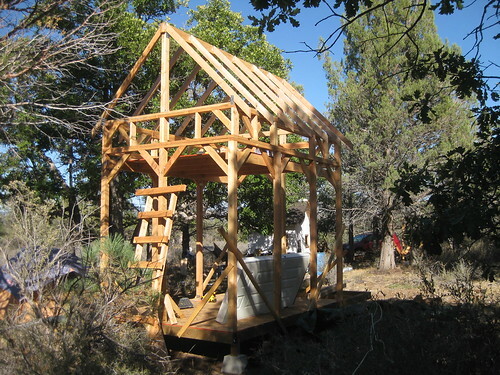 The next step is to add a couple of diagonals to the roof beam to firm it up, then start laying on the roofing. I’m just going to use OSB, then lay insulation on top of that, then Ondura roofing panels will go on top of that. I’m planning on completely finishing the roof before working on the lower parts of the hut, since it’ll be easier to hang scaffolding off the sides of the structure if the walls aren’t there yet. Also, now that it’s rained hard twice, it seems like getting the roof done sooner would generally be a good idea. In other news, my garden is in full bloom. 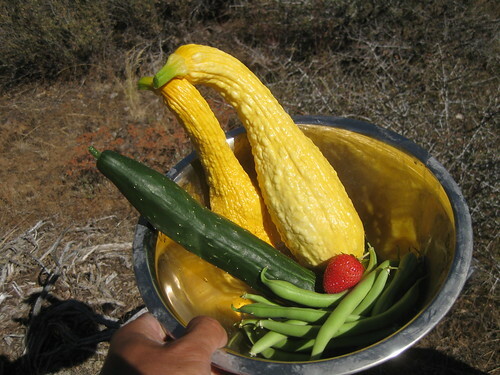 Yellow squash that were finger length when I left for Burning Man had ballooned into giant fruit almost the size of my forearm. I’ve also got more green beans, and a decently sized cucumber. I also have a few egg plants on the way, and giant green tomatoes that have stubbornly refused to ripen so far, but hopefully will soon. The corn has also matured, but the ears are quite small. Planting corn this year was definitely a mistake, though they did a great job of providing shade to the beans, which was a minor unexpected benefit (I alternated rows of corn and beans, and the rows of beans that got good shade from the corn did much better than the rows that were more exposed). More pics of Hut 2.0, and veggies! Just a quick post to let y’all know that I posted a few more pics. Progress on Hut 2.0 has been slow. I’ll be honest. Working alone means every task requires at least double the effort, which in turn requires double the motivation. Which means everything takes at least four times as long, or, if it’s 96F in the shade like it was yesterday, about 16x as long. 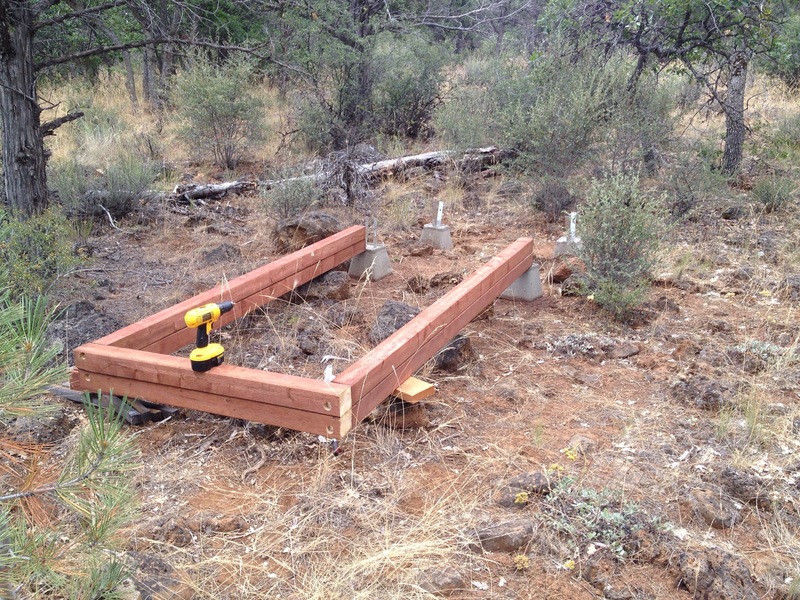 So… since my hut raisers left, I’ve gotten woefully little done. 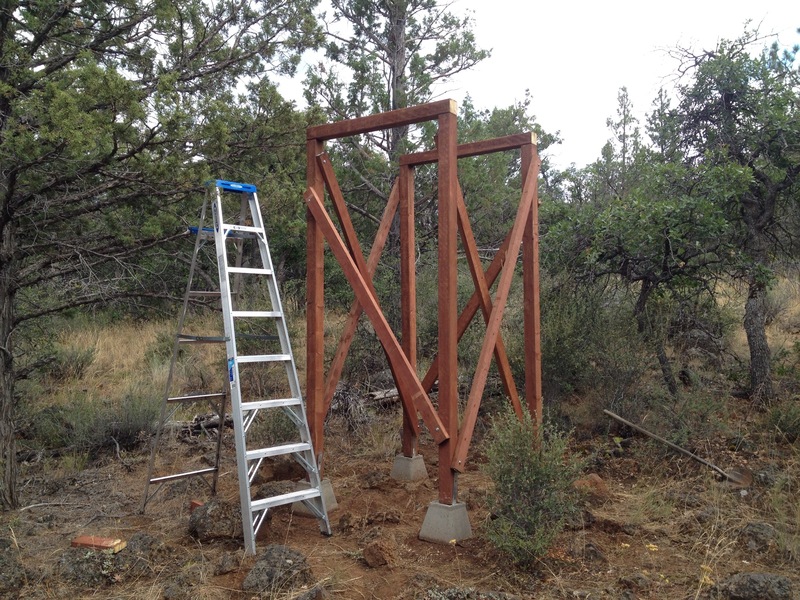 I’ve added diagonals to all the 4×4 posts, put up a couple of posts that’ll hold the roof beam off of which the rafters will hang, cut the roof beam, measured out the places where the rafters will go… and that’s about it. Oh, and I read a book. In other news, the garden is starting to mature, and I’m slowly starting to harvest some vegetables. So far, I’ve gotten some decent sized green beans, and it looks like I’ll have a yellow crooked neck squash ready for harvest in another couple of days, with plenty more on the way. I have an egg plant on the way too, though I’m not sure how big it’ll be. The tomatoes are still green, and taking their time ripening, but they’ll get there soon, presumably. I also just noticed today that I have some cucumbers on the way, which is exciting. The corn is also maturing, though the stalks aren’t nearly as tall as they should be, so we’ll see how big the cobs will be. Over all, it seems like most of my vegetables will be small in size and yield, but I’m happy to be getting anything, seeing how this is my first year growing a garden. I’ve learned a lot, and perhaps I’ll do better next year. 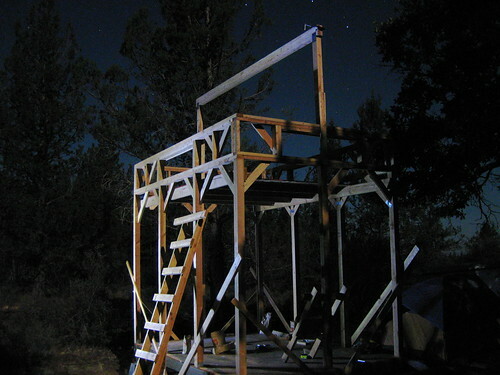 Next week, I’m off to Burning Man, which basically means packing up my camp and bringing it to the desert in Nevada. 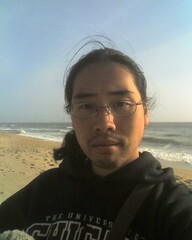 I wasn’t planning on going, but decided a few days ago that it’d be fun to hang out around crazy people for a change. I’m planning to organize an ad hoc gathering at my camp for people who want to (or think they want to) go live in the woods and/or build huts and cabins, to talk about my experiences and share information. We’ll see if anyone shows up. If there are any Burners out there reading this blog, keep an eye out for a flier on that board near center camp where such things get posted. I realized my mistake the first time I went to fill up my water tower. There I was stumbling over rocky terrain, with 56lb of water in each hand. For someone weighing only 140lb, hauling 110lb of water on rough terrain is no fun. Then I had to climb up the ladder pulling and pushing one of the water cubes up with me, and that too, was no fun. My original plan had been to pump the water using a 12V pump, but after my recent solar panel issues, I didn’t have enough power to run the pump. The only available power was in my car, but because I had placed the water tower about 30 yards away from the road, running the pump off my car wasn’t an option. The solution seemed simple. If the water tower were closer to the road, I wouldn’t have to haul water far, and I’d also be able to run the pump off my car. But, would I be able to move this 8ft tall structure that’s made of a dozen two-by-fours? 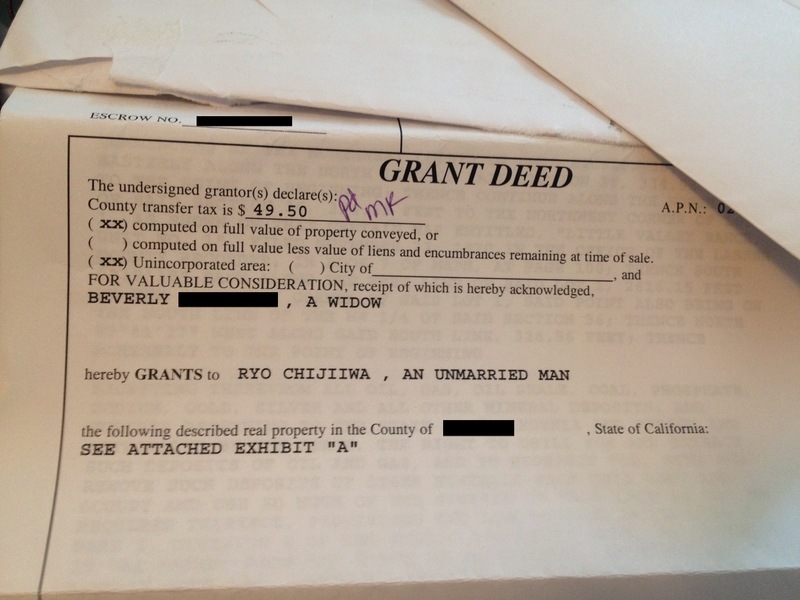 I considered rolling it end over end, Katamari-style, but that seemed precarious. It then occurred to me that the 6ft long “feet” I’d attached to the bottom of the legs might work as skids, and I’d be able to just drag the whole thing, over rocks and all. I added a couple of diagonal support pieces to reinforce the structure in the axis of movement, then off I went. It turned out to be a lot easier, and managed to find a nice flat patch of ground, about 10ft from the road, between the hut and the garden. At the new location, pumping water into the water container is really simple. I shut off the drain valve, hook up the drain hose to the pump, hook up the pump to my car battery, open the valve, and away it pumps. It takes a little while to prime, but once it gets going, it’ll empty a 7 gallon water cube in a couple of minutes. Once I got water up into the tower, I started laying down soaker hoses. I laid down a garden hose down the middle of my garden hose, then stuck barbed 1/4″ hose connectors into it to connect 1/4″ soaker hoses off of it. I used metal wires bent in a u-shape to stake down the hoses, and once I got the hang of it, it went pretty fast. I’ve had the system running for about a day and a half now, and the biggest problem is the flow rate. It drained about 40 gallons in a day and a half, which is way too fast. I need a full water container (50 gallons) to last me about a week, which should be enough since I’ve been using around 6 gallons a day when watering with a can. I got some valves which might help with the flow rate, but if not, I also got a timer so that I can limit how long/often it runs. Ironically, the flow rate might be high because there’s too much pressure, and this whole time, I was worried about not having enough. Another issue is that, some of the holes I opened in the garden hose might be leaking, so instead of poking holes in the hose, I’m going to use 3/4″ splitters and 3/4″-to-1/4″ reducers instead. Anyway, with a few adjustments, hopefully I’ll have the garden running itself soon.